This entry was posted in Comments about Cycling on February 23, 2016 by Steve Tilford. I’ve been spending the last few evenings over at the building I put a rubber roof on sorting through tools. Man do I have a lot of tools. The reason I’m having to sort through them is because about half the time I use these tools it is not here in Topeka, thus I load up a bunch of tools into the van, then they get all mixed up and when I’m back, I just unload them all in a big bunch on the floor. Plus, there is all the excess stuff that I’ve bought. Boxes of screws, nails and various other odd bits that might be useful on another project. Yesterday those odd bits didn’t seem so valuable, so most of them went into recycling. I love a project that involves buying a new tool. A new tool that isn’t that expensive, but is key to the project getting completed timely. 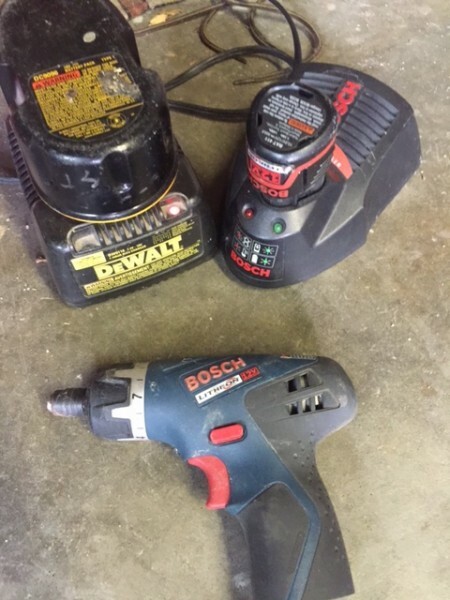 Cordless power tools have been a game changer the past 20 years. The batteries are getting better, thus the tool more powerful. I was looking at my odd collection of cordless power tools and was thinking it is about time I get a new set. I have quite a few Dewalt 18v tools, but they are so old and the drill drivers are about done. I find that I’ve already written a post about just about everything I think about, thus there is this one about tools that I did 3 years ago. I’ve been replacing this fence down in Richardson Texas the last few days. It always amazes me how important that the proper tools are for each and every situation. It isn’t only in construction, but everything you need a tool for. I’d say that a large part of doing construction is having the right tools for the job and always having the necessary components when they are needed. Nothing slows a project down than running out of anything. It goes in a certain order and when that order is interrupted then the project sometimes comes to a complete stop. The same when dealing with bicycles. 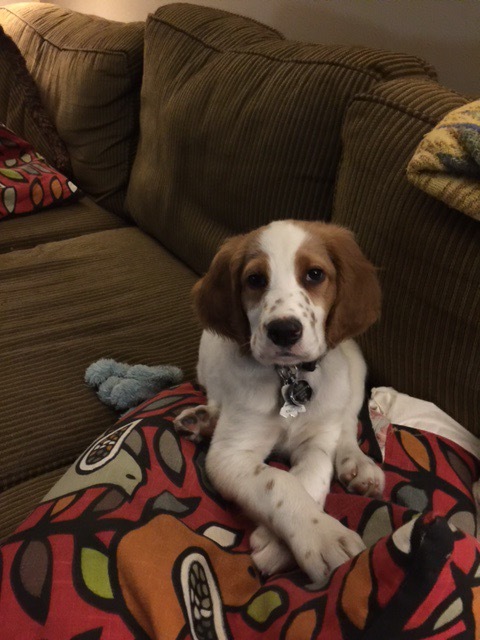 More so. Can you imagine not having a chain tool when one is needed? There is nothing that can replace that. Maybe in “wartime” you could use a punch and a pair of pliers to get a chain back together, but not in a race situation. Park Tool company is now taken for granted, but they have been innovators in bicycle tools. When Thomas Frischnecht first came to the US from Switzerland, he barely spoke English. It was about the same time that Park came out with the tri-tool, the y-tool with the 4-5-6 mm allen keys on it. When Thomas came to Boulder and stayed with me and saw the tool, he wanted to buy 50 and take them back to Switzerland and give them to his friends. He was that impressed with it. I have to agree. Life is much easier for me because there is a Park Hex wrench in the world. It holds true for lots and lots of tools. Specialty tools are just that, special. There are many situations that there is nearly only one tool that will work for a specific situation. And if that tool is missing or unknown to the person that needs it, then there is nearly a zero percent chance that the task can be completed. I guess this post is for me to acknowledge my appreciation to all the people out there that have thought through the process and made tools for each and every situation. It makes my life much easier on a daily basis. I always look for projects that “force” me to acquire new tools. If that is the case, then the project is usually always a success. This little Bosch driver is one of my favorites now. It fits in a pocket of a tool pouch and is pretty powerful considering its size. 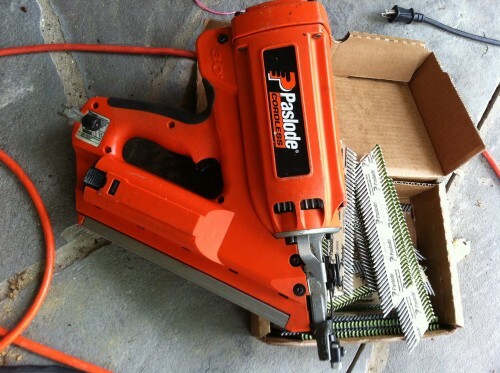 This Paslode nail gun is can virtually build a house by itself. 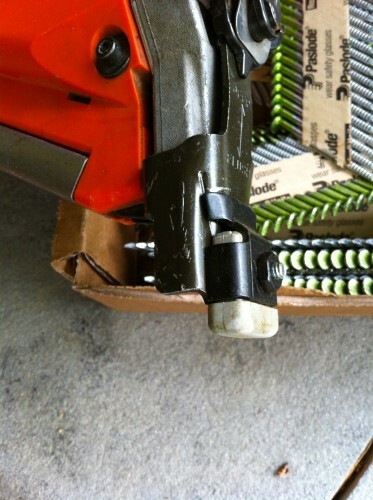 It is a framing nailer, but…..
it can also be used here with a non-mar tip to use on fences, etc. The Park tri-tool and Shimano chain tool are a couple of the tools that are indispensable. 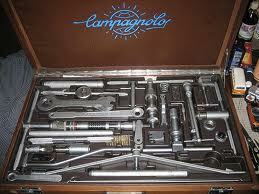 The Campagnolo Tool Kit. I still want one, even though most of the tools in it aren’t used for modern day bicycles now. 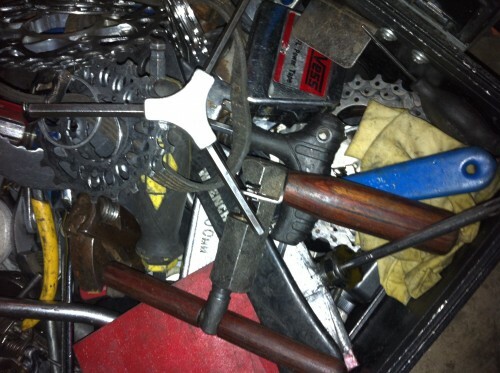 love tools… my dad was an electrician for 15 years, he had every tool going. So, I grew up with tools and duct tape. I remember when I was just a wee lad, my dad bought me a bike and took me to the top of this hill on our 25 acre farm. He let me go, that’s how and when I learnt to bike at around age 3. Hit the ground hard, bike busted… tools came out. From that point on I loved tools, but hate fixing things though. I get pretty frustrated, love swearing while fixing stuff, but the final product is so rewarding. Having biked for around 25 years now, I think I have every tool going for biking. Bike parts did exist (along with bikes) in every room of my house. It looked like a bad crack house, but with bike stuff everywhere. I managed to find me another mate (after being through 2 nasty divorces, ouch! I’m stupid for searching for another…) , she helped me clean the place up. I managed to hide my bikes in closest and in the dark basement cellar. Tools sit riddle the house though and my winter bike, see video samples below, sits in my living room. My get to work ride (-15oC here today) sits on the front porch. Tools are essential up here at 45.4214° N for the weather varies a lot, things break down a lot. Park tools survive the test of time for the most part. typical tools I always carry with me (winter) – pump, chain break, standard allen keys, tire levers, spare tub, duct tape around the pump handle. My house is old, built in the 1940s, so it requires a lot of work. I bought a whole host of tools to fix it. Dewalt being the best so far. Can really kick the crap out those tools. They survive, american made eh! not made overseas, anything made overseas only last a few months then its junk. I love collecting tools, I have to be careful going to Canadian tire (our hardware/automotive store up north), I get my fix of tools and come out spending a fortune on tools. Love having a good collection of tools. Love to build a woodworking shop next. One of these days… as a hobby for my latter years in life. Thomas Frischnecht – met him at La Ruta around 2006. Came in first place. I’m having good luck with the Makita lithium 18v series. good battery life, quick charging. We had the Campy tool kit in our shop in the 80’s. I swear to God, when you opened it, an orange glow emanated from it, and angels sang. If I could just stop dumping tools on the floor when I finish a job on the farm, I would be a long way closer to being next to Godliness, at least in appearance! I also love my tools. At least the ones that are hanging on the wall and/or in the toolbox.